Model: Suzuki GSXR600 601 GSXR750 GSXR 750 2002-2007. OEM Quality Motorcycle Fuel Pump & Fitting Kit. Position: In Tank. Any models shown in the application table are just a guide. Labour claims are never accepted. You get the parcels at your doorstep without any hassle. PART NUMBER : 15100M830A1. 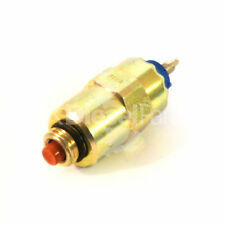 Common Rail Pressure Regulator (DRV Valve) 0281002872. CITROEN C5 (DC_) 2.0 HDi Diesel 2001/03 - 2004/08 RHZ (DW10ATED), RHS (DW10ATED) 107. CITROEN C8 (EA_, EB_) 2.0 HDi Diesel 2002/07 - On RHW (DW10ATED4), RHT (DW10ATED4), RHM (DW10ATED4) 107. Manufacturer: KEMSO in Japan. The KEMSO 340 high pressure pump is capable of supporting applications of up to around 700-800bhp. 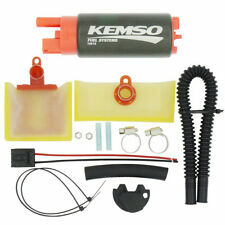 • 1x Genuine KEMSO 340 Fuel Pump. (For gasoline vehicles, In-tank design, E85 Compatible). Suzuki Samurai Santana 1,0 SJ410. Multi Applications Stop Solenoid 12v (ESSO) 9108-073A. Why Buy An Advance Solenoid Actuator Valve From UK DIESEL PARTS?. UK Diesel Parts Advance Actuators are supplied by Flag who are based in the EU and are an OE manufacturer and distributor of automotive technologies and parts ISO9001 certified. REMOVED FROM:2006 SUZUKI GRAND VITARA SUV 1.9 DDiS AWD. 5 SPEED MANUAL DRIVE. IF YOU ARE ORDERING FROM THE HIGHLANDS, OR OTHER ISLANDS IN THE BRITISH ISLES AND THE ITEM IS. SUBARU 1510079J00. SUZUKI 1510079J00. SUZUKI SX4 (EY, GY) 1.5 (RW 415) Hatchback Petrol 06/2006 07/2010 FWD 16 99 73. SUZUKI SX4 (EY, GY) 1.5 VVT (RW 415) Hatchback Petrol 07/2010 on FWD 16 112 82. SUZUKI SX4 (EY, GY) 1.5 VVTi Hatchback Petrol 07/2007 12/2015 FWD 16 110 81. Fuel Pump In tank 0580200940 Bosch. Part Number 0580200940. SUZUKI 1510061M00. Function Fuel Feed Unit. BOSCH 0 580 200 194. THIS DOES NOT COVER NI, HIGHLANDS AND OFFSHORE CHANNEL ISLANDS. SUZUKI 1510085501. Engine Code: F10A. SUZUKI CARRY Pickup 1.0 (DA21T) Pickup Petrol 07/1985 12/1990 RWD 8 45 33. SUZUKI SUPER CARRY Box (ED) 1.0 (SK410) Box Petrol 09/1987 07/1992 RWD 8 41 30. SUZUKI SUPER CARRY Box (ED) 1.0 (SK410) Box Petrol 04/1985 07/1992 RWD 8 45 33. Reference OE/OEM Number: 55185549, 55185549 FGP. All our parts are genuine! Part Number: 0 445 010 092.and don't forget drive safely! Item Condition. Price: 67 GBP. Notes: Broken pipe. It's compact size and impressive output give this fuel pump the massive popularity it deserves. Part Number: GSS342. Trust genuine, trust us! Simply type 'How to spot fake Walbro GSS342 fuel pump' into a search engine and we'll sure to be near the top of the results. FOR SUZUKI VITARA. Vehicle compatibility. This is an original quality part manufactured by Blue Print. Blue Print is the complete solution. This is helped by the fuel pump. It is an essential component on most vehicles. We apologise in advance for any inconvenience caused. # GENUINE SKV GERMANY - FUEL PUMP - HEAVY DUTY. # About SKV Germany. Are you worrying how to proceed warranty if you are from different country?. For details seeWarranty Policy. Product Type: Fuel pump. Suzuki Swift. All gearboxes must be filled with new oil, to the correct level upon installation. Wakefields Friendly Professional Vehicle Breakers. This part has be been removed from. Highlands and Islands. RENAULT KANGOO (KC0/1_) 1.9 dCi 4x4 (KC0V) 1870 59/80 1997-08. RENAULT ESPACE III (JE0_) 2.2 dCi (JE0K, JE0S) 2188 95/130 1996-11. RENAULT LAGUNA II (BG0/1_) 1.9 dCi (BG0R) 1870 74/100 2001-03. RENAULT LAGUNA II (BG0/1_) 1.9 dCI (BG0E) 1870 77/105 2001-03. OPEL AGILA (A) (H00) 1.3 CDTI (F68) Hatchback Diesel 08/2003 12/2007 FWD 16 70 51. OPEL AGILA (B) (H08) 1.3 CDTI (F68) Hatchback Diesel 04/2008 04/2010 FWD 16 75 55. OPEL COMBO Box Body / Estate 1.3 CDTI 16V Box Body / Estate Diesel 08/2005 on FWD 16 69 51. 1x Fuel Pump for SUZUKI HONDA KAWASAKI Technical Details: h=67 mm l=113 mm d=38 mm - 3,0 BAR - 85 L/h Suzuki: Suzuki Samurai SJ 1.3 AWD 1988/11-2004/12 1298 ccm, 51 KW, 70 PS Suzuki Samurai SJ 1.3 AWD 2000/01-2004/12 1298 ccm, 59 KW, 80 PS Suzuki: SIDEKICK 1.6 1995- SIDEKICK 1.6 16V 1995- SIDEKICK 1.6L 89-91 SIDEKICK 1.6L 92-94 NR OE: FP10006 GCA355 E2111 UC-T30Z 15100 57B01 15100 61A02 15100 80C02 15100-57B01 0 986 580 093 0986580093 others. We send details of your order to the Suzuki dealer nearest to you. Take a Suzuki authentic part for example. So hassle free fitting and you have to replace them less. Each component is manufactured using the latest technology, and of course, is designed to enhance your Suzuki’s unmistakable look and style. SUZUKI ALTO 2005 1.1 PETROL 1061CC ELECTRIC FUEL PUMP OUT THE TANK. We are located at Autoline Motors Ltd, Froghall Stoke on Trent. OEM Quality Motorcycle Fuel Pump (10mm Outlet)YAMAHA SUZUKI HONDA KTM OUTSIDE TANK FUEL PUMP May also fits other models. Model: YAMAHA SUZUKI HONDA KTM OUTSIDE TANK FUEL PUMP May also fits other models. THIS ITEM IS A USED SUZUKI SWIFT MK3 1.3DDIS (Z13DT) INTANK FUEL SENDER / PUMP. REMOVED FROM A 2006 SUZUKI SWIFT DDIS. VEHICLE GUIDE. BERLINGO 1.6 HDI 75 / 90 / 110 HP:75 / 90 / 1092008-ON. -BERLINGO (MF) 1.6 HDI 75 / 90 / 110 HP:75 / 90 / 1092005-2008. -C2 (JM_) 1.4 HDI HP:68 2003-2009. -C2 (JM_) 1.6 HDI HP:109 2005-2009. - C3 (FC_) 1.6 16V HDI HP:90 / 109 2005-2009. SUZUKI SWIFT III (MZ, EZ) 1.3 DDiS (RS 413D) Hatchback Diesel 08/2005 on FWD 16 69 51. SUZUKI WAGON R Hatchback (MM) 1.3 DDiS (RB 413D) Hatchback Diesel 09/2003 on FWD 16 70 51. Fuel Type Diesel. Fuel Mixture Formation: Common Rail (CR). SUZUKI SUPER CARRY 1.0 ELECTRIC FUEL PUMP. OTHER PART NUMBERS Money back. Warranty Provided 12 Months. Suzuki | Vitara. Semi Universal in tank fuel pump.Exactly replaces the original on most in-tank applications but can also be used as an In-tank upgrade (A new wiring harness plug is always supplied). Vauxhall Fiat Suzuki 1.3 Cdti Jtd Fuel Pump Bosch 0445010138 55198933 Good condition and tested. Item will be sold as it is shown in the pictures (you will receive exactly what you can see in the pictures). Please remember it is an used car part and don't expect it to be like brand new. Please compare the part numbers or ask in case of any doubts before buying or making offer. The only way to be 100% sure that the part will fit your vehicle is to check the part number on your original unit matches one of the above. Any information in the compatibility table is for reference only and there may be unspecified choice options. Citroën Xsara Picasso 2013 N68 [1999-2016] MPV MPV 1.6 HDI 1560ccm 90HP 66KW (Diesel). Citroën Xsara Picasso 2012 N68 [1999-2016] MPV MPV 1.6 HDI 1560ccm 90HP 66KW (Diesel). Citroën Xsara Picasso 2011 N68 [1999-2016] MPV MPV 1.6 HDI 1560ccm 90HP 66KW (Diesel). 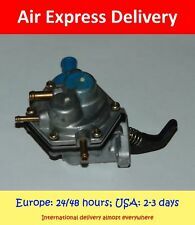 GENUINE SUZUKI SWIFT 1.2 PETROL 11-12-13-14-15 ABS PUMP. The abs pump will fit from 2011-2012-2013-2014-2015, also the abs pump is in full prefect working order, condition and without any problems, it is just the abs pump and it is a genuine suzuki part, also it has been checked before it was removed from the car. Suzuki Intruder Volusia VL800 800K4 800ZK3 800ZK4 2001-2004. OEM QUALITY MOTORCYCLE FUEL PUMP & FITTING KIT. Labour claims are never accepted. At AMS we know how difficult buying car parts can be, but we do everything we can to make it as easy as possible. SUZUKI GRAND VITARA 1.9 DDIS HIGH PRESSURE FUEL INJECTION PUMP 8200342594. Condition is Used. Dispatched with Other 48h Courier. Lemark Fuel Pump Feed Unit. Suzuki Swift (MK III) 1.5 Petrol (2005-). Suzuki Swift (MK III) 1.6 Petrol (2006-). Fitting Position: in fuel tank. The only way to be 100% sure that the part will fit your vehicle is to check the part number on your original unit matches one of the above. [04/98 - 09/05] SUZUKI GRAND VITARA SQ625 2.5L H25A. 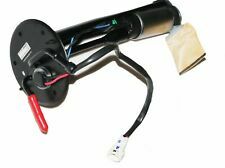 New FLM Fuel Pump For Holden Berlina Ve Series 1 3.6l Hfv6 Lw2 Bi-fuel. 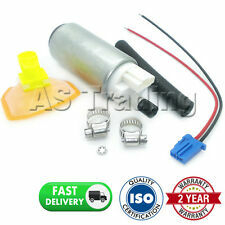 New FLM Fuel Pump For Audi A3 Typ 8p Tfsi 2.0l Axx,bwa. New FLM Fuel Pump And Filter Kit For Toyota Rav4 Aca33r 2.4l 2az-fe. OEM QUALITY MOTORCYCLE FUEL PUMP (6MM INLET / OUTLET). Contents: Fuel pump including. Various Honda & Kawasaki Models. All of our products are sourced directly from our range of approved factories. All of our parts are subject to quality testing and are ISO TS16949 certified, we also search to make sure that our approved manufacturers use the latest technologies and materials available. Suzuki SV1000S 2002-2007. OEM QUALITY MOTORCYCLE FUEL PUMP & FITTING KIT. Suzuki Hayabusa GSXR1300 GSX1300R GSXR 1300 1300R RZ 1999-2012. OEM QUALITY MOTORCYCLE FUEL PUMP & FITTING KIT. Suzuki Hayabusa GSXR1300 GSX1300R GSXR 1300 1300R RZ 1999-2012. OEM QUALITY MOTORCYCLE FUEL PUMP (PUMP ONLY). Contents: Fuel pump only.